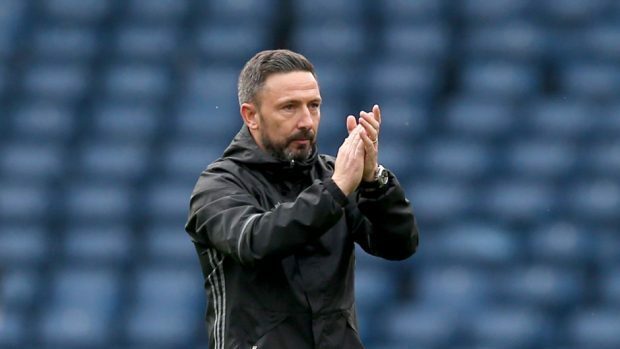 Defiant Aberdeen manager Derek McInnes insists his side will win the race for second place in the Scottish Premiership. The Dons are licking their wounds after a 3-0 home defeat by Rangers on Sunday. Victory for the visitors resulted in Aberdeen’s lead in second place being reduced to nine points but McInnes expects his Reds to respond strongly to the setback. “We’ve been on a very good run but that doesn’t give you any guarantees and it’s a reminder that there is still work to be done. The Dons travel to St Johnstone on Saturday and McInnes wants to see a strong response from his side and a return to the defensive resilience which evaporated in a mad four-minute spell on Sunday. He said: “We have six league games left and we have to make sure our response is the same as it normally is. Our response to a defeat is normally followed by a winning run and hopefully we can start that on Saturday. “We normally respond well to going behind and mentally we have to be stronger than we were on Sunday. It doesn’t happen too often but we have to react better than that and if there’s one lesson from the game, it is that. You need to concentrate against good players. We need to do that for the full 90 minutes. “It’s a sore one for us. In the eyes of our supporters that’s a huge disappointment and we understand that. “We don’t lose many goals at Pittodrie and we don’t normally go behind. It is important that the players deal with that situation better. It is something we have spoken about. Hopefully, that will help us in the challenges ahead. Defender Mark Reynolds is in contention for a return to the squad for the trip to Perth after missing the last six matches due to groin surgery.